But what if you have to clean yourself with natural substances (excluding natural soap)? Well, my initial thought is about three methods to remove the dirt and bacteria: ash, eggs, and Saponaria officinalis. As the first two methods are more popular than the latter, today I will discuss with you what Saponaria officinalis is? We will go through the origin, etymology, and geography of this exotic species. We will unhide its chemical composition and properties. 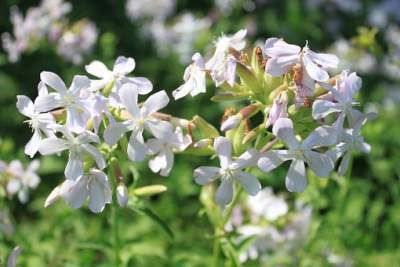 At the end of the text, you will know what benefits can Saponaria officinalis bring to your skin and hair. And most important, you will learn what the best way to use it, and get an advantage of its properties is! It is a plant from the carnation family and has different names. 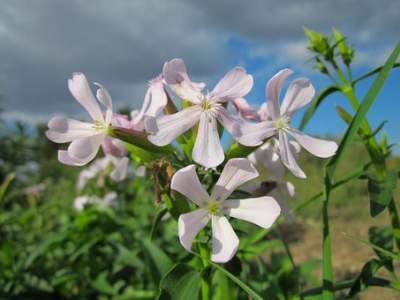 Maybe you have heard it as common soapwort, or soapweed? Well, it is one on the same flower. The term Saponaria comes from the Latin word sapo, which means soap. Just for the record – you can meet this herb, as wild sweet William, crow soap, bouncing-bet, Fuller’s herb, lady’s washbowl, leatherwork, dog cloves, sweet Betty, foam dock. All these different and sometimes funny names are an indication of how popular Saponaria officinalis is around the world. 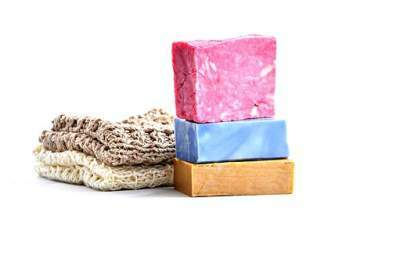 Why “soap” in the name? Because when mixed with water, soapwort produces lather and has cleaning properties. The Officinalis part of the name means this herb has been used for medicinal purposes. Saponaria officinalis grows in Europe, North America, and Asia. Did you know, it is edible? In the Middle East, people have included it as an ingredient in some sweets’ recipes. And you can drink it as a tea. But our word today will be about its unusual properties for your skin and hair. If you want to produce easy and quick lathery cleansing liquid, you can boil Saponaria leaves in water, filter the mixture and use it for washing purposes. Let’s see what can Saponaria officinalis chemical analysis reveal us. Soapwort contains mineral salts, glucides, and vitamin C. What’s even more interesting; it has triterpenic saponins. Saponins have immune-strengthening and anti-cancer properties, decreasing bad cholesterol in the body. Saponins, vitamins, mineral salts – that sounds great! So what comes as a result? It was ancient people, who have first discovered the healing benefits of Saponaria officinalis. The “Father” of medicine Hippocrates and other physicians have used it for its purifying, detoxifying, diuretic, balancing blood pressure, and cough treating properties. Anti-inflammatory effect, calming sensitive and irritated skin and scalp. In general, Saponaria officinalis is very appropriate for any skin disorders, including acne, eczema, boils, itchy skin, and psoriasis. It soothes, calms and revitalizes the skin, as you will feel the relief pretty soon, after usage. If you are very eager to use freshly picked common soapwort, you can apply a simple recipe: pick a flower and rub the blossom on the irritated skin area. Repeat the procedure a few times a day, for better effect. If you overdose it for internal usage, common soapwort might cause muscle tremors, drought in the mouth, tongue paralysis, vomiting, diarrhea, nausea. In massive doses, it can be poisonous, so it’s always an excellent option to consult your doctor, or experienced herbalist if you plan some medical treatment with Saponaria officinalis. Avoid using it, if you are pregnant, or breastfeeding mom. Okay, now you know how beneficial this miraculous plant could be for your skin! It has a unique double positive effect – both purifying, and healing it! A real treat isn’t it! It will be a big miss, not to take advantage of it, so next topic we will cover is how exactly to do it. No wonder, extract from common soapwort is famous in many natural cosmetic products. Its hair care and skin care properties are used in many formulas. And why not – it can purify, smooth and kill bacteria on your skin. It can be astringent and seboregulator, regarding your hair. When mixed with other natural compounds, carrier, and essential oils, Saponaria officinalis extract is a perfect component, included in natural soaps and shampoos. It brings quality and value to the recipe, so when you search for a specific cosmetic product, scan the list with the ingredients. You will be happy to find a bunch of natural components, with one of them, being common soapwort! How to be confident in finding high-quality natural products? Check HERE a few rules that you can follow to ensure the right process. In a nutshell, what is Saponaria officinalis? If you want my answer, it is a herb, which you cannot afford to miss when you take care of your skin and hair! It has so strong healing and purifying properties, which you have to take into account. Its substance and its smell can give you this sense of purity, health and will carry away you in the old times when your ancestors have used cleansing agents and shampoos, produces only from natural ingredients. Your next step? Search for natural cosmetics and sanitary products with common soapwort, test them, to find which ones work for you best! Take action, and take care, so your skin is happy! I would love to hear from you! Do you (plan to) use Saponaria officinalis? Leave me a comment, and I will answer you!